The city of Detroit was founded in 1701 by Antoine de la Mothe Cadillac. Originally called Port Pontchartrain, it's name was changed to Fort Detroit in 1751, named after the river whose northern banks the growing settlement rested. It was later shortened to just "Detroit" when it passed into British control at the close of the French and Indian War. In 1904 Henry Ford founded the Ford Motor Company with competitors GM, Dodge, and Chrysler following soon after. It wasn't long before Detroit was regarded as the automotive capital of the world. 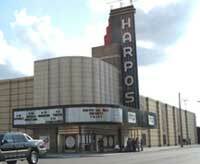 Detroit's Harpos Theatre was originally called Harper Theatre, named for its location on Harper Avenue. It boasted an 80-foot towering marquee that could be seen blocks away. Designed by architect Charles N.Agree for the Wisper and Wetsman theater chain of Michigan, the Harper Theatre could hold almost 2,000 people and featured an art deco exterior plus large murals in the lobby and auditorium by local Detroit artist, Thomas di Lorenzo. (*note: Lorenzo also did murals and sculptures for other Wisper and Wetsman theaters such as the Royall Theater, and did the famous mural of the apostles at Detroit's Central United Methodist Church.) In the 1970's the theatre was converted into a nightclub/discotheque and it's name was changed to Harpo's. "Rites of Passage", those rituals that mark a change in a person's social or sexual status, vary greatly from culture to culture. Heads shorn of their locks, body parts painted, pierced or otherwise mutilated, and spectacular feats of prowess are just a few examples of how some societies mark the transition from adolescence to adulthood. In the South Pacific island of Vanuatu, young native tribesmen leap off huge trees with vines tied to their ankles to test their manhood. Adolescent males wishing to become Masai warriors are expected to kill a lion single-handed, armed only with a spear. For Detroit Headbangers, there is a simpler but no less dangerous way to mark the passage from youth to adult -- a night of revelry at the infamous Harpos! Situated in one of the worse sections of the city, Harpos has had a reputation for violence inside as well as outside of the club. If you weren't trampled in the Mosh Pit, there was always the random acts of violence on the dance floor or outside in the parking lot. Bums would hang out in the parking lot charging first timers for bogus parking privileges or protection from vandalism. Guard dogs and the presence of the local police were a regular, and not always an unwelcome, intrusion. 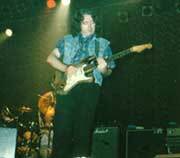 Following a run of 4 successive nights in Ontario, Canada, Rory Gallagher played to an enthusiastic crowd at Harpos Theatre on June 8, 1985. Rory had not toured in the States for a couple of years save for a brief month long tour in 1983. With no new album and no radio airplay would they still remember Rory? Timothy Lamb former guitarist for the Buick City Blues Band was at the show and bore witness to Rory's enduring popularity. Despite his 2-year absence from the Detroit music scene, he could still fill a nightclub with his ardent supporters. So head on down to the East Side of Detroit, down to where Harpos' towering marquee jabs it's middle finger skyward in mock defiance of top forty drivel. Cross the club's "no man's land" parking lot, past bums, bangers, and babes, and enter into the belly of the Rock 'n Roll Beast. Rory has returned to the Motor City and is ready to perform his own spectacular feats of guitar prowess at the infamous Harpos. To read Tim Lamb's account of Rory's show at Harpos, click >>> HERE. To download an mp3 of Rory's show at Harpos, click >>> HERE. To receive notification when a new bootleg is uploaded, click >>> HERE. This bootleg sounds better as your ears adjust, and your ears adjust quickly because bad penny and follow me are so hot! I also liked the reflective moments in songs like Bad penny, tattooed lady, etc. Good bootleg to have even though it seems incomplete. Thank you Milo for another one from your incredible collection. Thanks Milo for a great tribute to a great musician. It's a thrill beyond words to be able to hear this show again after so many years!